That antique engagement ring stashed away in your attic could be worth thousands of dollars. If you’ve ever seen Antiques Roadshow, you know there’s a lot of money in antiques. But just as there’s money in antiques, there’s also deception. Antique engagement rings are classified as such if they’re at least 50-years old. Some people try to pass-off vintage or estate rings as antique engagement rings, but that’s deceptive. By definition, vintage or estate rings are less than 50-years old and not classified as true antiques. If you’re in the market for an antique ring, you must educate yourself in order to avoid scams. It’s easy to take a new ring and make it look old. The only true way to tell if an antique is genuine is to have it appraised. But what if you’re out treasure hunting, and need to make a decision right away? Then it’s in your best interest to learn all you can about antique engagement rings. Antique engagement rings often contain stones other than diamonds. A diamond has a hardness of 10, and is extremely durable. However, softer stones such as emeralds (7.5 to 8 hardness), opal (5.5 to 6.5 hardness) and, pearl (3.5 to 4 hardness) were commonly used in antique engagement rings, especially during the Victorian period (1835-1900). Keep in mind that some antique engagement rings are fragile, especially those containing softer stones. All antique engagement rings aren’t created equal. Just because a ring is antique doesn’t mean it’s worth anything. For this reason, craftsmanship is very important. Avoid antique engagement rings that are badly damaged or poorly constructed. Don’t judge the quality of antique engagement rings using modern standards. Jewelry making techniques have evolved and even the best antique engagement rings may show slight imperfections. Perfectly clear diamonds are often considered the most beautiful and desirable. But at one point in history perfectly clear diamonds weren’t in demand. People wanted color, and often sought diamonds with slight tints of brown, yellow, red, and green. So if you see antique engagement rings with colored diamonds, understand it doesn’t mean the diamonds or the rings are fake. Where are Antique Engagement Rings Sold? Antique engagement rings are available in a number of places. Some modern jewelry stores sell authentic antique engagement rings obtained from estate sales, auctions, and customers. 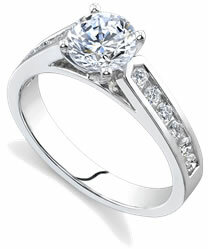 But you can also purchase antique engagement rings first-hand from antique stores, pawn shops, online, and estate sales. If you know nothing about antiques, you should probably stick to stores that specialize in antique jewelry. Regardless of where you search for antique engagement rings, examine every piece closely. The seller should provide accurate descriptions of any piece. Before purchasing any antique ring, you should know the age, condition, size, clarity, and cut of the ring. Get this information in writing for insurance purposes. Many antique jewelry dealers have gemologists on hand to provide the necessary information.